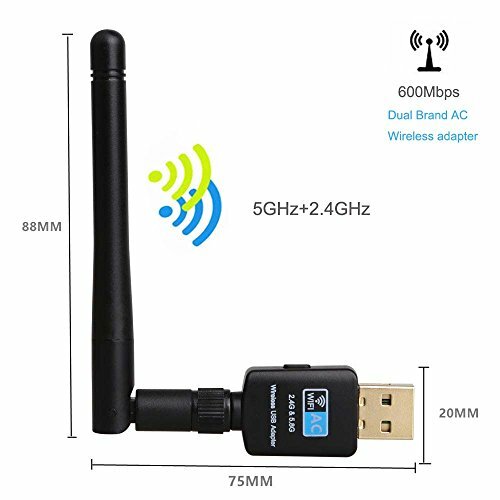 New experience of enjoying 5.8GHz+2.4GHz dual band with OFDM wireless technology,It presents less signal interference while works at 5.8GHz frequency, and provide better transmission with its 433Mbps data rate,The unique design brings easy and free wireless digital life. Newest 802.11ac wifi technology: Maximum speed up up to 600Mbps Wi-Fi speeds on 5GHz/433Mbps or 2.4GHz/150Mbps bands. Good for streaming, gaming, HD movies and video-chatting and more. Newest WPS Secure Tech: Easy to set up a secure, WPA-encrypted connection with a push of the WPS button, Remembering long passwords free. Works with all router:It can upgrade your Desktop, Laptop, PC or Mac to work with AC wifi router for faster speed and extended range,bring you excellent network experience. Customer service:All goods will be tested well before shipping, If there have any problem of goods, Please feel free to contact us, We will help you to solve it at 24 hours. If you have any questions about this product by JUHANG, contact us by completing and submitting the form below. If you are looking for a specif part number, please include it with your message.